CSUN’s Department of Cinema and Television Arts joins the prestigious Hollywood Reporter list as one of the best film programs in the United States. 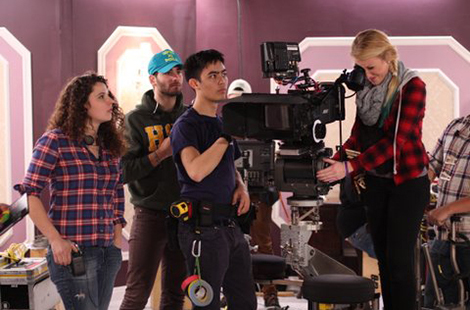 Read more about the top film schools. Highlighting that CSUN’s reputation has reached “new heights,” President Dianne F. Harrison said her vision for the university’s future includes building a strong foundation to produce world leaders. Read more about the convocation. Some of CSUN’s most interesting science research takes place not in Northridge, but 26 miles across the ocean at Catalina Island. The Department of Biology offers students a semester of marine research. Read more about the marine research. Thu., Aug. 28, 7 p.m.
Fri., Sept. 5, 7 p.m. Sat., Sept. 20, 8 p.m.
Grow your speaking profile from square one. Learn how to become an impressive public speaker. The event offers participants the chance to live the life of a CSUN basketball player, including unprecedented access to Coach Reggie Theus and the inner workings of the CSUN men’s basketball program. Share in the celebration of the 50th reunion and anniversary for alumni from the class of 1964 and faculty/staff who began their service to the university in 1964.